MY FAMILY LIVED IN THIS HOUSE FROM 1990 UNTIL 1994 AND IT’S WHERE I GOT MARRIED. Hey, I lived there. The Big House is what my dad called it when we lived here, everybody knew which house he was referring to. Historic house gets new lease on life, Group to move Jeffersonville home to new site. A 100-year-old house near Clark Memorial Hospital will be moved to save it from demolition. 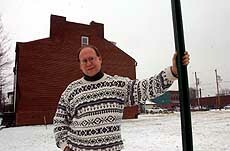 The Frank Willey house at 105 Sparks Ave. is a structurally sound example of the homes that once filled the neighborhood around Sparks Avenue and Spring Street a century ago, said Greg Sekula, director of the Historic Landmarks Foundation of Indiana office in Jeffersonville. 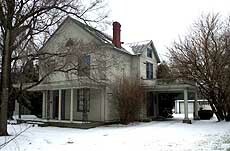 Cindy Dicken, spokeswoman for the hospital, confirmed that it is giving the house — which recently has been used only for storage — to the landmark foundation. Greg Sekula, a Historic Landmarks Foundation official, said the vacant lot behind him will be the new home for the Frank Willey house. ”We will be turning that property into a parking lot for emergency services,” Dicken said. The property is across the street from the emergency-room entrance and a hospital parking lot that is often crowded. The landmark foundation’s southern regional office plans to move the two-story, 2,900-square-foot woodframe house on April 6, Sekula said. It will be moved near downtown Jeffersonville to 115 W. Chestnut St., next to the 1837 Grisamore House, where the foundation’s Jeffersonville office is located. The foundation’s office will move to the Willey house after it is relocated and refurbished, Sekula said, and the Grisamore house will be sold. The painstakingly restored Grisamore House, which has roughly 4,500 square feet of floor space, probably will be priced at around $325,000, Sekula said. The entryway is indicative of homes that once filled the area around Sparks Avenue and Spring Street. He hopes it will be used as a home or office, Sekula said, and maintained in its current historically accurate condition. The move and refurbishing of the Willey house, which was built in 1902, is expected to cost as much as $280,000, Sekula said. The foundation is still seeking some money for the project, he said, but it has some that will come from preservation grants and Clark Memorial. Before the Willey house is moved, Sekula said, some exterior features, including a porte-cochere, or carportlike structure, will have to be removed. 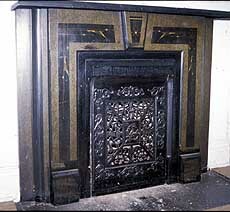 The fireplace, above, is one of the architectural accents in the 100-year-old Jeffersonville house, below. The remainder of the house will then be moved intact to a foundation that will be prepared for it on the empty lot at 115 W. Chestnut, Sekula said. Exterior details will be retouched or replaced in a way that is accurate for the time the house was built, Sekula said. ”It’s one of the last remaining houses in what was a substantial middle-class neighborhood near the hospital,” Sekula said. Its age and style will fit with other buildings on West Chestnut, he said. The landmark foundation has moved other buildings to save them, Sekula said. But he wasn’t aware of its having moved any historic Jeffersonville houses before. The foundation also is trying to save the Cardinal Ritter House on Oak Street in New Albany. 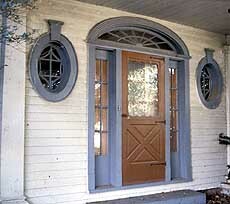 It has bought and stabilized the century-old house and is considering ideas for refurbishing and reusing it. The foundation also provides the staff for and consults with the New Albany Historic Preservation Commission. This entry was posted in Willey-Allhands House and tagged Willey-Allhands House on February 20, 2003 by Rob Jones.